Stress happens whether we like it or not, no matter how much we prepare for it. Having a list of positive activities readily available is key because you'll never know when that stress will strike. 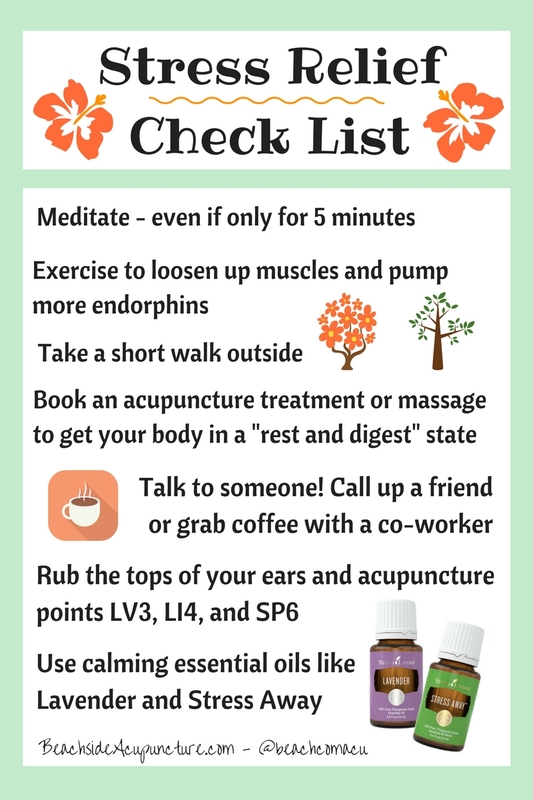 We at Beachside Community Acupuncture like to incorporate the physical and mental when we're dealing with stress, as you can see from our list. Involving the body in your stress relief - either through activating different senses with essential oils or by giving it gentle exercise - can not only provide more of a distraction but also influence the brain to rethink how's it's perceiving the stressful situation. Make a go-to list of stress relievers for yourself - they may be different from ours - and have it around so you know what to do when you feel overwhelmed. That way you won't agitate yourself more trying to figure out how to feel better!